ROCKLAND- Multiple award-winning boogie-woogie blues pianist-vocalist Victor Wainwright continues his 2018 U.S. and Canadian Spring/Summer Tour for his new album “Victor Wainwright & the Train” (Ruf Records), with a performance at Time Out Pub, 275 Main St., Monday, April 25. Showtime: 8 p.m. Tickets: $20. Info: (207) 593-9336 or visit https://www.facebook.com/TOPRocklandMaine/. Born into a musical family in Savannah, Georgia, the formative influence of his father’s vocals and grandfather’s rolling boogie-woogie piano compelled him into a life of music. 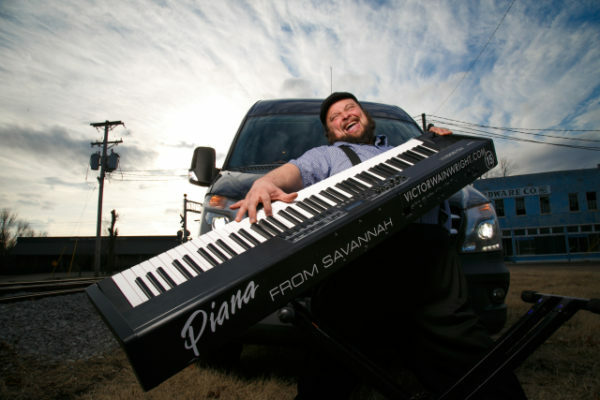 By 2005, he’d announced his talent with solo debut, “Piana’ From Savannah”, while his central role in Southern Hospitality and partnership with Stephen Dees in WildRoots has seen him ignite stages and stereos for over a decade. Among his numerous accolades: In 2013 and 2014, Wainwright won the ‘Pinetop Perkins Piano Player of the Year’ at the Blues Music Awards. Also in 2013, his collaborative album, Easy Livin’ , made the Top 10 in the U.S. Billboard Top Blues Album Chart. The twelve tracks on his new album are originals in every sense, written by Wainwright, pricking up ears in a sterile music industry and stretching the concept of roots in bold directions. “I wanted to write this new music mostly on my own,” Wainwright explains, “as it was coming and speaking to me. I believe that for roots music to grow, and reach out to new audiences, we have to push it forward.” The result is an album that walks a tightrope between scholarly respect and anarchic irreverence. His words can be hilarious, as on “I’ll Start Tomorrow,” on which he postpones his doctor’s clean-living advice. But they can also be heartfelt, on the gospel-tinged kiss-off of “That’s Love To Me”. A man of many talents, Wainwright is a composer, producer, vocalist, piano player and award-winning entertainer. A long-standing leader of the boogie-woogie pack, he could refer you to his BMA and Blues Blast trophies, or a catalog that has repeatedly hijacked the Billboard Top 10. But rather than dine out on past glories, this questing artist would rather you joined him for the ride ahead.